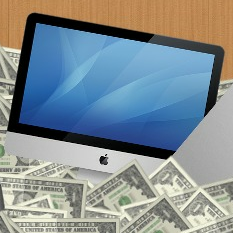 We last covered the subject of AMD Hackintoshes in 2012, with our article on AMD Hackintoshing for Snow Leopard. To recap on the subject, the problem with AMD Hackintoshes lies in the Mac OS X kernel. The kernel is a critical file that lets applications in Mac OS X communicate with the hardware of your Hackintosh. The standard kernel (known as the "vanilla" kernel) is only designed to support Intel processors. You can circumvent this problem by using special versions of the vanilla kernel that have been modified to work with AMD processors. Back in the days of Mac OS X Snow Leopard, the most popular AMD-compatible kernel was the "legacy kernel", which was developed by nawcom. However, nawcom left the Hackintosh community early in 2012, and the task of creating an AMD-compatible kernel for newer versions of Mac OS X has since fallen to other developers. One kernel to rule them all. For Snow Leopard, almost every AMD Hackintosh used nawcom's legacy kernel. For Lion, you actually have multiple options-- that being said, the best option these days is probably Bronzovka's kernel (named "AMD Kernel 10.7.x" in the given link), which was developed in collaboration with several other developers on InsanelyMac. There's no advantage in a distro. The easiest way to install Snow Leopard on an AMD Hackintosh was to use a "distro", a pirated copy of Mac OS X that had been specifically modified to work with Hackintoshes. Nowadays, however, no Lion distro works on AMD processors by default. Therefore, this article will instead focus on how to install a retail copy of Mac OS X Lion on an AMD Hackintosh with the tool myHack. Mountain Lion isn't ready. Right now, Lion is the most stable version of Mac OS X available for computers with AMD processors. While multiple Mountain Lion-ready kernels have already been developed, Mountain Lion on AMD still isn't ready for primetime. The main problem with Mountain Lion on AMD is graphics support-- discrete AMD Radeon graphics cards still experience major graphical glitches in Mountain Lion, while other graphics cards don't work at all. 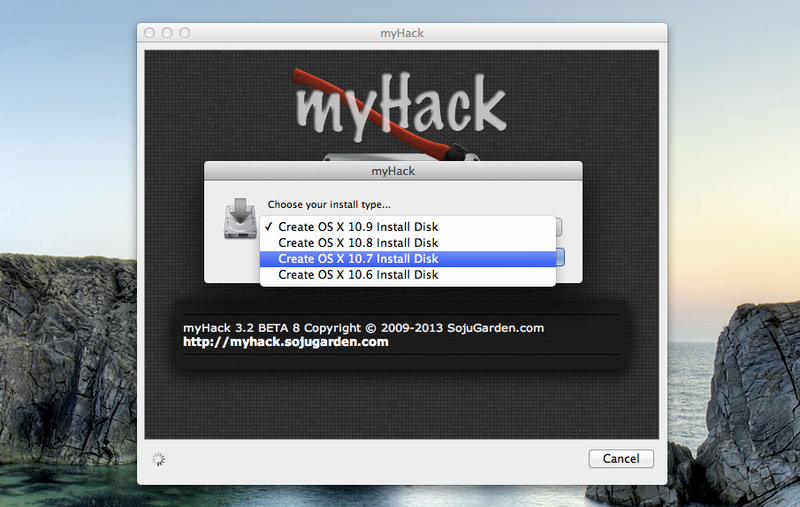 myHack (Free): myHack is a Mac program that modifies the official Mac OS X Lion installer, and writes it onto a USB drive. 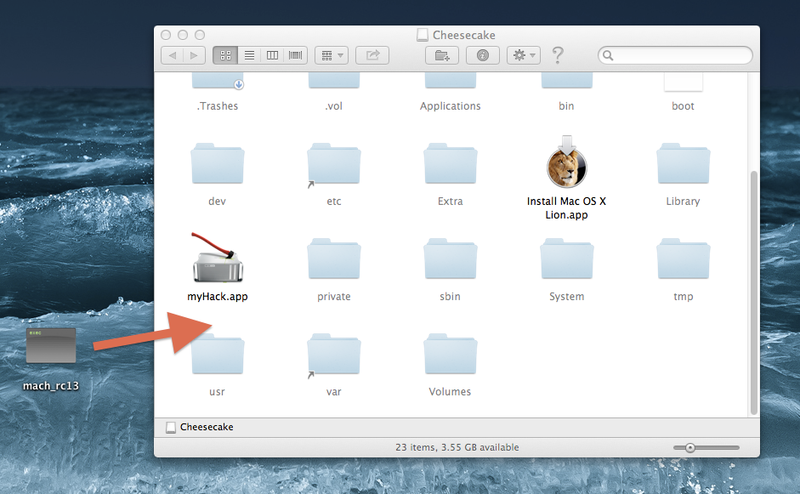 You can then use this myHack USB drive to run the Lion installer on a PC. 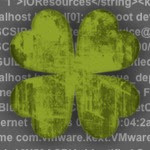 myHack requires a Mac/Hackintosh running Mac OS X Snow Leopard or newer. An existing Mac or Hackintosh: myHack is a Mac app, so you need a computer with Mac OS X to run it. You could use a real Mac or existing Hackintosh, if you own one. If you have a Windows computer, you could install Snow Leopard on a virtual machine, and create the installer USB drive from there. If your Windows computer has an AMD processor, you'll have to use nawcom's ModCD instead of iBoot during the installation process, as detailed in our Snow Leopard article on AMD Hackintoshes. A Hackintosh-compatible computer: This is the computer where you will install Mac OS X Lion. It can be the same computer as the one mentioned in the previous point. However, not every computer will work with Mac OS X. Be sure to read the Hackintosh compatibility guide very carefully, to check whether or not your computer qualifies. All the requirements for normal Hackintoshes also apply for AMD Hackintoshes (except the requirement for an Intel processor, of course). An empty USB drive (8 GB or larger): The USB drive used for myHack must be at least 8 GB in size. Since myHack will erase all of the files on your USB drive, make sure to back up its contents first. You can reuse this USB drive for normal stuff after you finish installing Lion. Multibeast (Free): Multibeast is a collection of kext files that your Hackintosh will need to run properly, after the initial installation. Download it onto a USB drive. Be sure to download version 4 of Multibeast, not the older versions 3 or newer version 5 (which are for Snow Leopard and Mountain Lion, respectively). 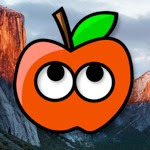 Bronzovka's modified "AMD kernel" (Free): This kernel file has been modified to allow AMD computers to boot Mac OS X Lion. To download the file, open the link and go to "AMD Kernel 10.7.x". Upon clicking the "Download" button, you will be given two options. If your computer has an AMD processor with a model number that starts with "FX" (e.g. the FX-4100), download the "mach_rc13ForFXSeries.zip" option. Otherwise, download "mach_rc13.zip". Boot into Mac OS X, either on your existing Hackintosh or your real Mac. From there, run myHack on your USB drive. Check out Steps 1-2 of our myHack installation guide for more details (the guide is written for Mountain Lion, but myHack is the same for Lion-- just choose the "Create OS X 10.7 Install Disk" option when it asks). NOTE: If you plan to install Mac OS X Lion on a hard drive that already has Windows installed, be sure to "patch the installer for MBR support" when myHack asks. DOWNLOAD: Bronzovka's modified "AMD kernel"
The kernel will be stored inside a ZIP file. Double-click on the ZIP file to open it, and obtain the kernel file. Next, enable viewing of hidden files on OS X. 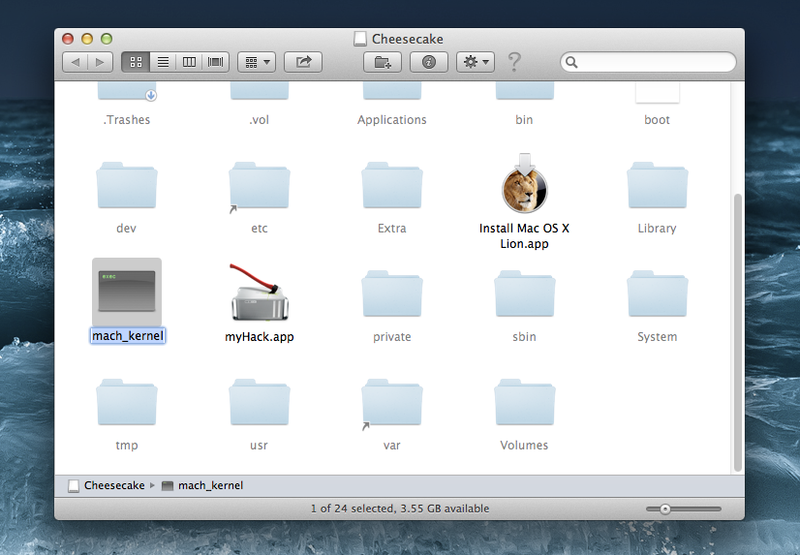 Then open your myHack USB drive from Mac OS X. It should look like this. Delete the "mach_kernel" file, and then copy the AMD kernel file onto the USB drive instead. Rename the AMD kernel as "mach_kernel". This will replace the normal Mac OS X kernel with the AMD kernel. Now you can use this USB drive to install Mac OS X Lion on your computer. Check out Steps 3-6 of our Lion installation guide for details-- the guide is supposed to be about Unibeast, but the installation process is the same. You'll still have to make sure that your computer and BIOS are set up (Step 3-4), and go through the normal installation procedures (Steps 5-6). NOTE: You may need to use the boot flag -nossse3bit to boot the Lion USB drive (Step 6). You may also need to choose between 32-bit mode and 64-bit mode when booting-- for that, use either the boot flag arch=i386 (32-bit) or arch=x86_64 (64-bit). When you install Mac OS X Lion on your AMD Hackintosh initially, the new Lion installation will be using the standard kernel, which doesn't work with your processor. This means that your Lion installation will be unbootable-- to fix this, you have to delete the standard kernel currently located in your Lion installation, and replace it will the modified kernel located on your myHack USB drive. Before you do this, make sure that you remember the name of the hard drive that Lion is installed on, and the name of your myHack USB drive. Keep your myHack USB drive plugged into your Hackintosh, and restart your computer. Once you reach the myHack boot menu, boot into the Mac OS X Lion installer again. From there, go to Utilities->Terminal in the top menu bar. Replace "Name of USB drive" with the actual name of your myHack USB drive, and replace "Name of hard drive" with the actual name of your hard drive. Again, keep the quotation marks in the command. This copies the modified kernel from your USB drive to your hard drive ("cp" stands for "copy"). Once this is done, restart your computer. You will be able to boot your Lion installation with myHack, from the myHack boot screen. 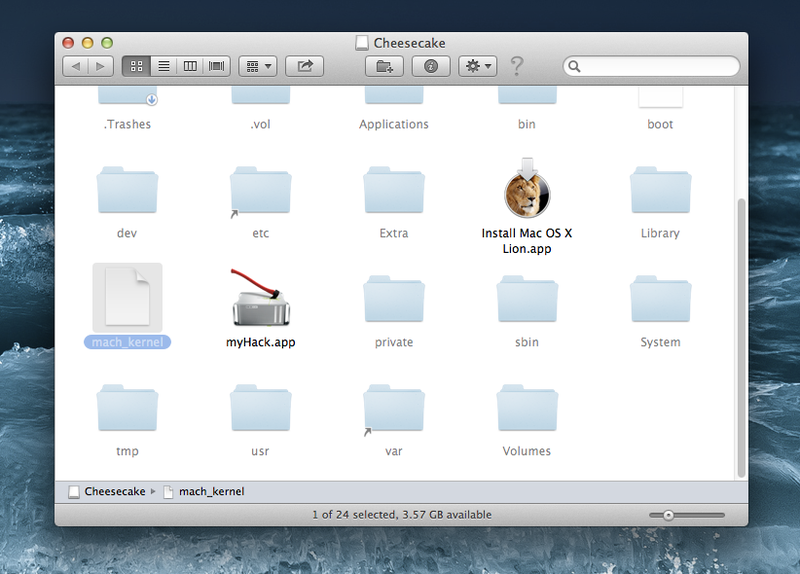 From here, you can run post-installation tools like Multibeast, so Mac OS X Lion will run at full functionality. Check out Steps 7-8 of our Lion installation guide for more details. Once you've successfully installed Mac OS X Lion on your AMD Hackintosh, you're on your own. AMD Hackintoshing is still a fringe activity in the community, and support remains sparse (or in some cases, nonexistent). If you need any help, be sure to check out InsanelyMac, which is currently the largest hub of AMD activity in the Hackintosh world. Until then, best of luck.